Tablet-book. 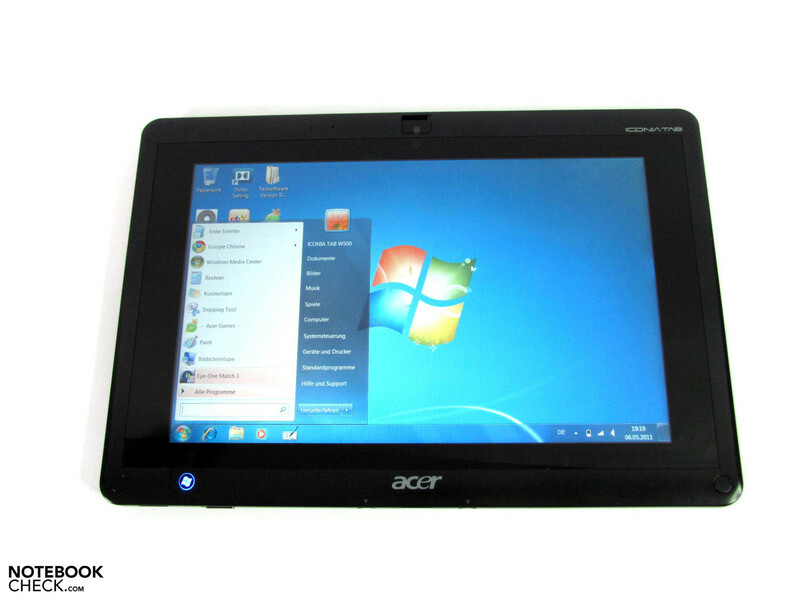 A tablet that you can transform into a netbook without much ado is what Acer has created with the Iconia Tab W500. But not only the design causes a rage, the technical innards also attract attention with AMD's C-50 CPU and HD 6250 graphics chip. We checked the performance in comparison to the standard configuration of comparable netbooks and tablets. Pure-bred tablets are currently booming, but encompass the drawback for many users that they can't really replace a full-fledged notebook. Even if secondary and tertiary devices are in fashion, many are satisfied with a device that is able to do almost everything. Most users miss a real keyboard and a sensible connectivity in tablets for also using it with basic office tasks. Moreover, Android and iOs isn't everyone's thing and hardly offer the programs and functions otherwise known from PCs. 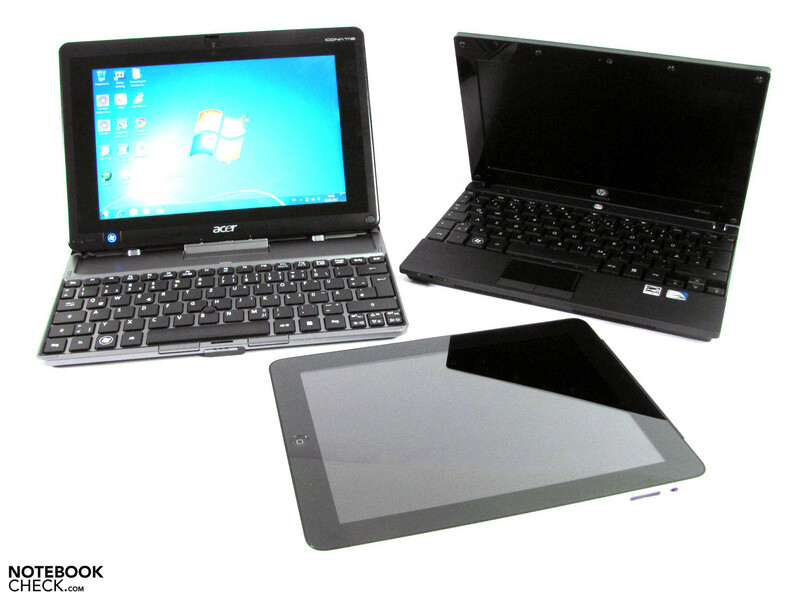 Acer now has a computer in its array that can poach in both the tablet sector as well as in the netbook division with the Iconia Tab W500. On the one hand, the tablet basis (which is also available separately) together with the keyboard including docking function and for another, Windows 7 as the operating system ensure this. The Iconia tablet is especially comparable with the Asus Eee Slate from the fundamental concept. No matter if with or without Keydock, both currently available Iconia Tab W500 alternatives use AMD's technology in form of the C-50 dual core CPU and the Radeon HD 6250. A 2 GB RAM and a 32 GB SSD are also included. 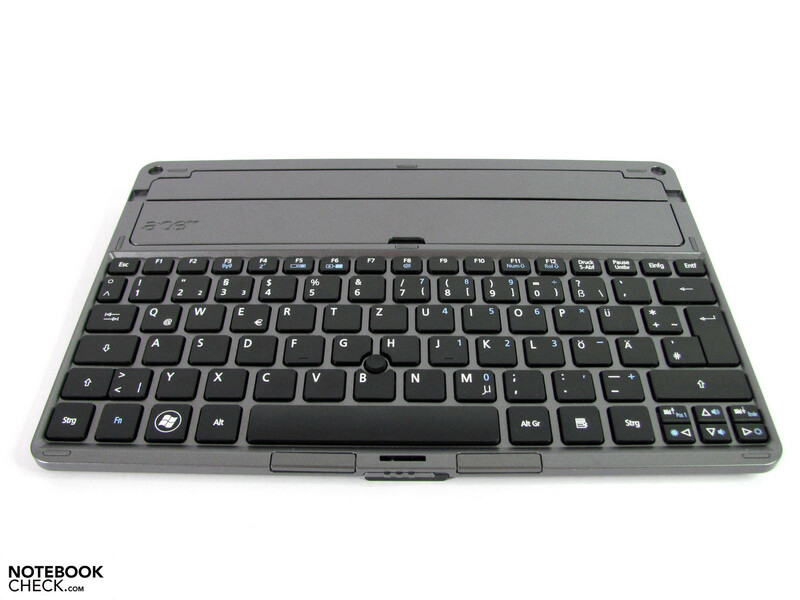 The prices start at nearly 500 euros; our test device with a dockable keyboard costs 580 euros (both street prices w/o shipping). The case makes a quite quality impression, which is particularly due to the surfaces with a brushed aluminum look. The stability and workmanship are also right, even if Apple's iPad is still a in a class of its own. 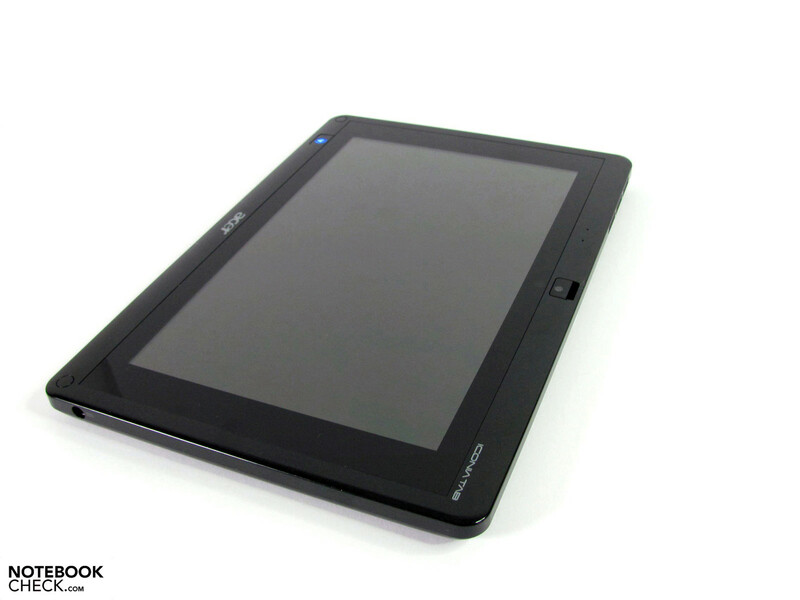 The Iconia Tab can easily stand out from the competition, like the Archos 101 or the Toshiba Folio. The weight of the test device is 940g, whereas a further 610g for the Keydock and 190g for the power adapter have to be added if you want to take everything along on a trip. 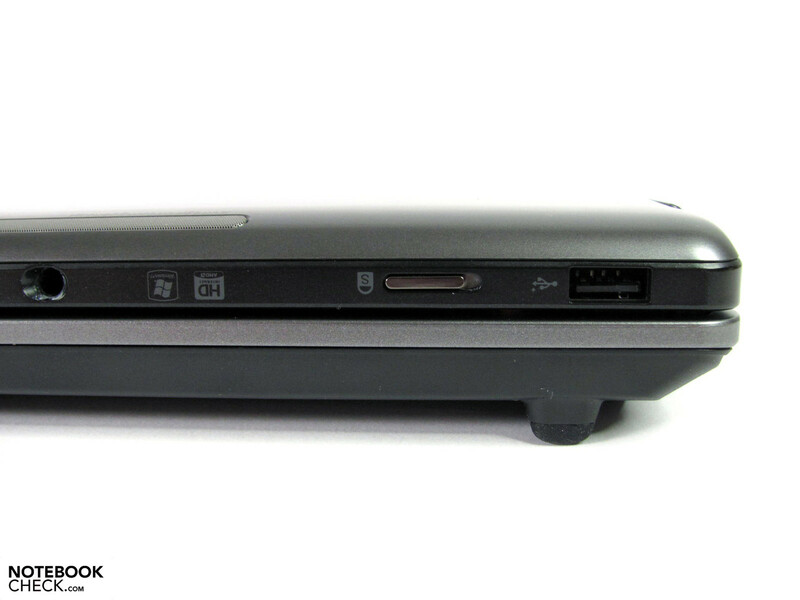 That is quite a lot of weight for a netbook, and all the more for a tablet even without accessories. For example, the iPad 2 weighs 613g and the Samsung Galaxy Tab even only 380g. Compared to the 1160g Asus Eee Slate, the Iconia is a bit lighter. 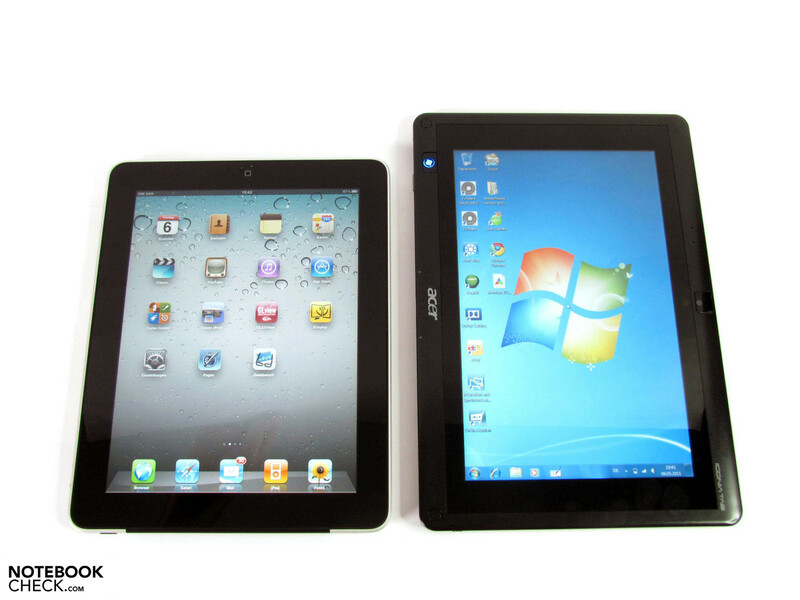 The dimension of 275mmx190mmx20mm is evidently larger than the iPad's, also because of the 16:10 display. You even get the impression that an even bigger screen belongs to it due to the broad bezel. Nevertheless, the device is pleasant to hold, place on the lap or on the table. Holding it gets quite strenuous after a few minutes though and you automatically look for a support. 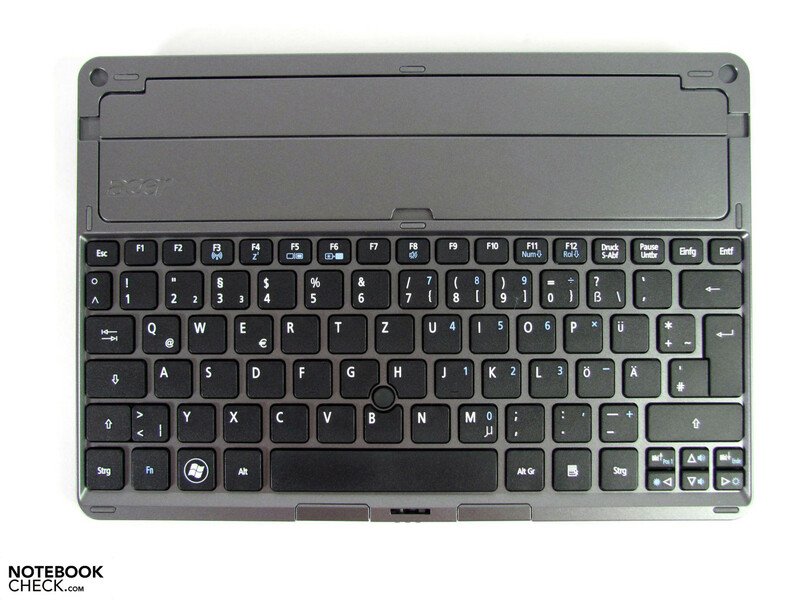 Acer's dockable keyboard offers this. 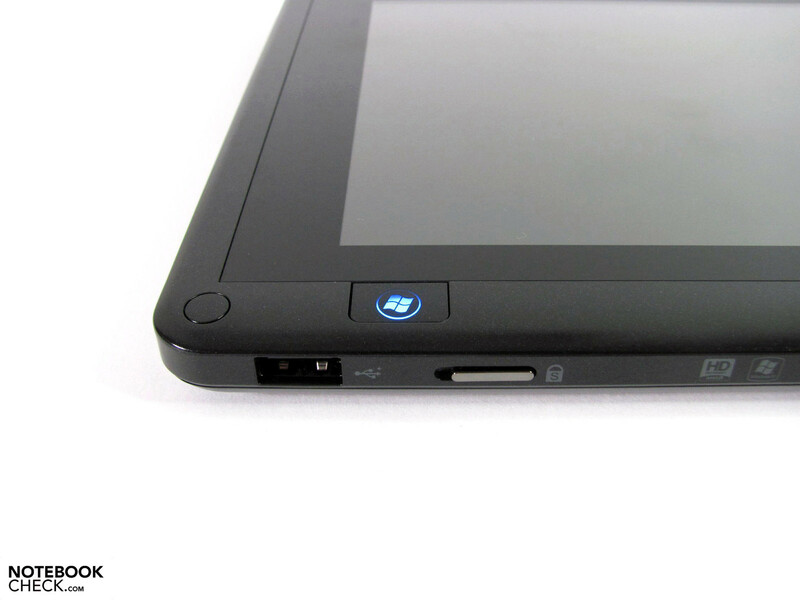 The tablet is simply inserted laterally into the top. Data transfer is accomplished via USB 2.0 and two locking pins on the ports left and right of the socket provide the necessary hold. The construction is stable in normal desktop use on an ordinary desk. 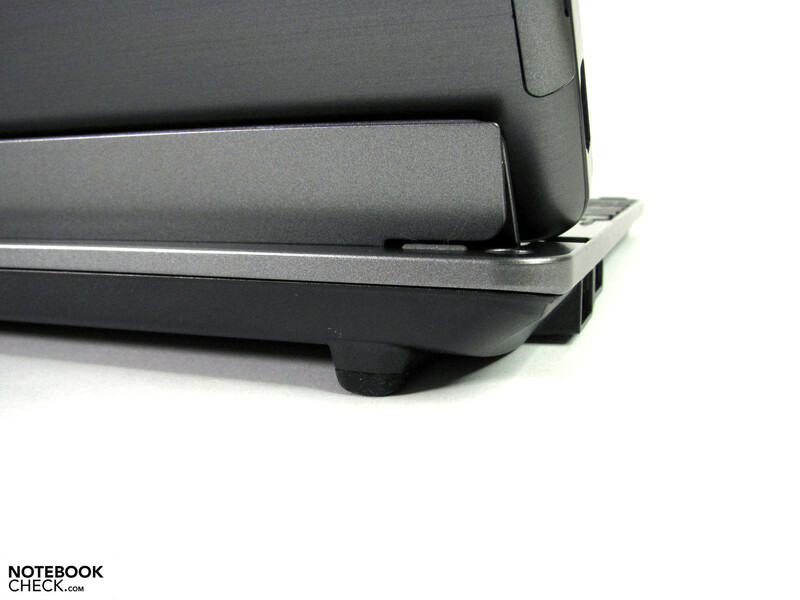 However, the tablet's high weight causes a top-heavy weight distribution, which could lead to the combination toppling over on adversely downwards sloping surfaces or by a stronger nudge. The Iconia Tab W500 is rather well equipped together with the Keydock. Above all, you also have a network socket that you will scarcely find in this category. A standardly sized HDMI port takes care of video output. There are a total of four USB 2.0 ports installed. However, only a maximum of two can be used at the same time. 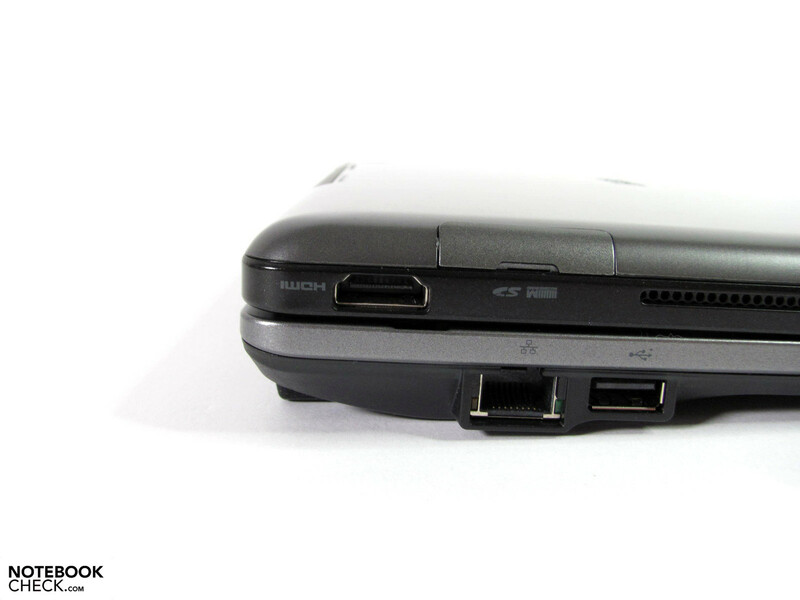 The central USB port on the bottom is needed when the Iconia W500 is inserted into the dock. 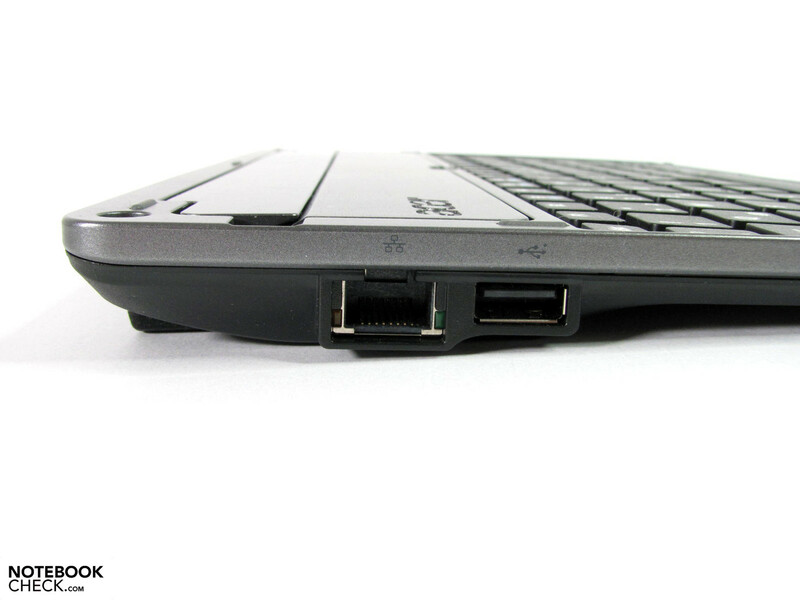 At the same time, the 2nd USB port on the same side is blocked by the keyboard and thus not accessible. They are replaced by two interfaces on the keyboard's left and right. Otherwise, data exchange can also be accomplished via a memory card (SD, SDHC, MMC). Its accessibility is also ensured in the dock. The transfer rates are below average via both USB 2.0 and SD card with a maximum of 16.7, respectively 9.8 MB/s. There are no fast interfaces such as eSATA & co. The cardreader's and SIM card's cover comprised of a plastic/rubber mixture are finicky in use and are especially annoying when changing memory cards. Besides the stationary network socket, communication is also possible via WLAN 802.11 b/g/n. The prepared SIM slot doesn't have any functionality in our model, but models with UMTS module could still follow. The Iconia Tab W500P, for example, is allegedly equipped with UMTS. It is also already listed on the support site, but is currently not sold by any retailer. You can make use of a 1.3 MP webcam for video telephony and there is an additional 1.3 MP camera on the flipside. Bluetooth 3.0 takes care of wireless connections to mobile phones, mice & co. The warranty is, as usual for this device and price range, 1 year. The statutory warranty period of 24 months of course remains unaffected. 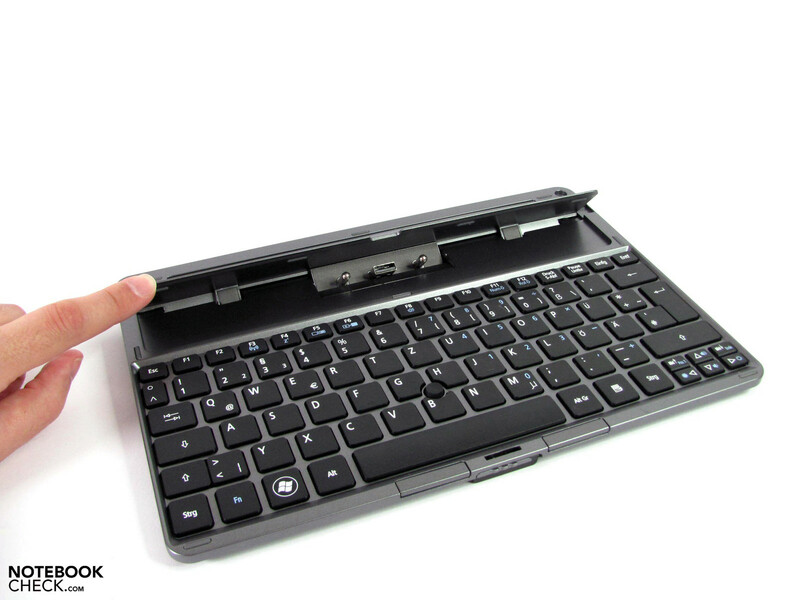 A big advantage of the keyboard in comparison to that of the Asus Eee Slate: it doesn't wobble. It has a solid stance and the key field can be depressed. It has about the same size as 12" laptop keyboards, large keys in a 19 mm grid, a short key drop and a pleasant stroke behavior. 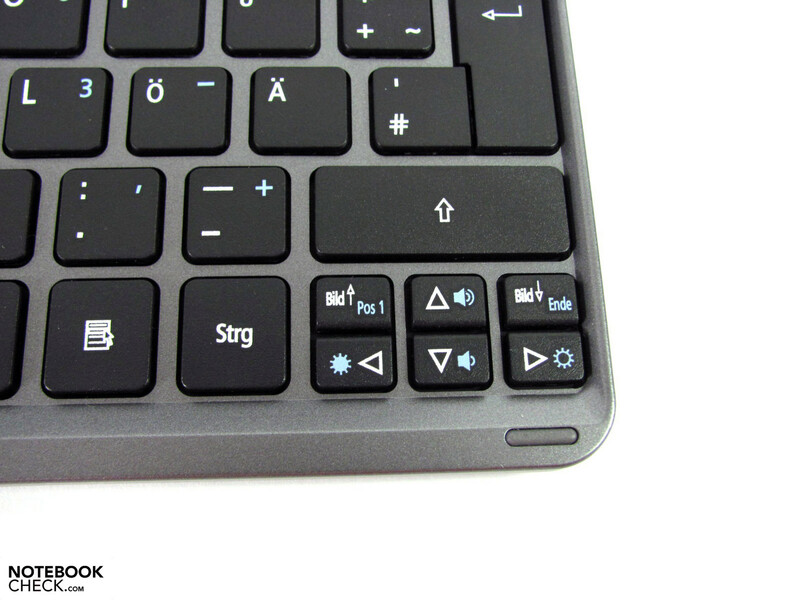 The return and hash key are adversely close to each other, which could lead to typos in the beginning. The layout doesn't give any mysteries and the lettering has a contrast rich print. 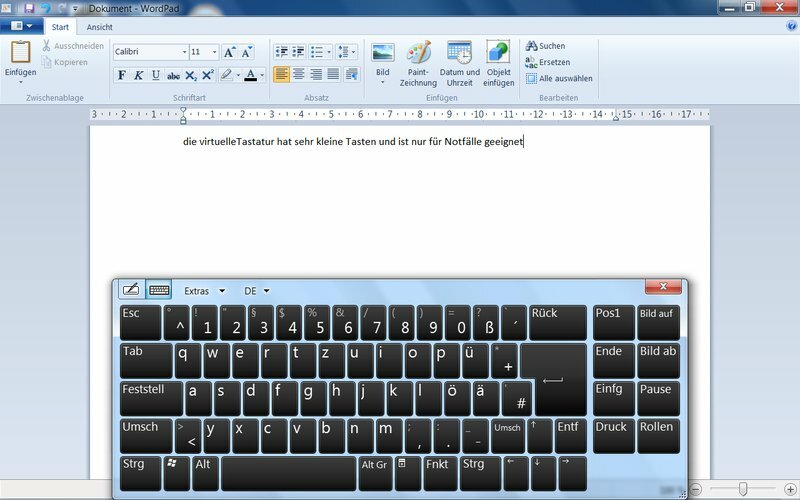 Basically, the keyboard is suitable for prolific typists and will be the preferred inputting method in stationary use. 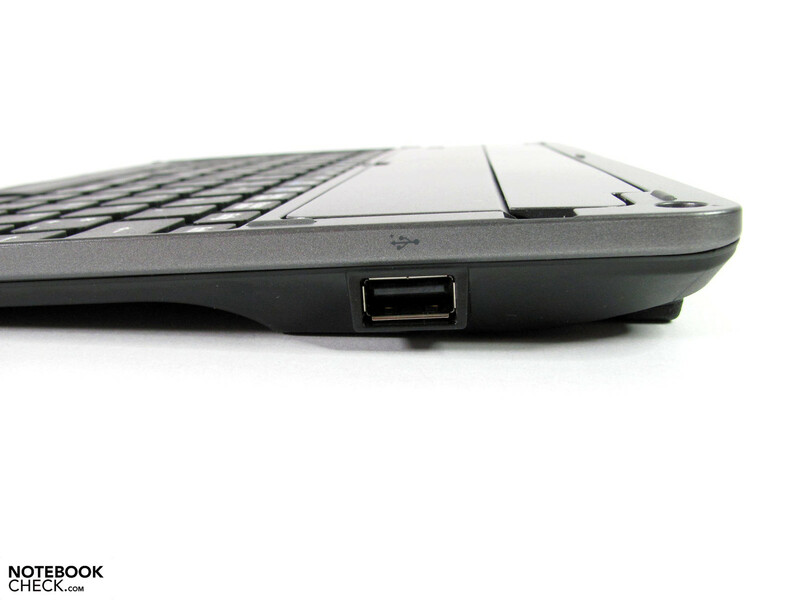 The PointStick is a space-saving alternative to the usual installed touchpad. If you are used to this method of inputting, you'll be able to cope right away. 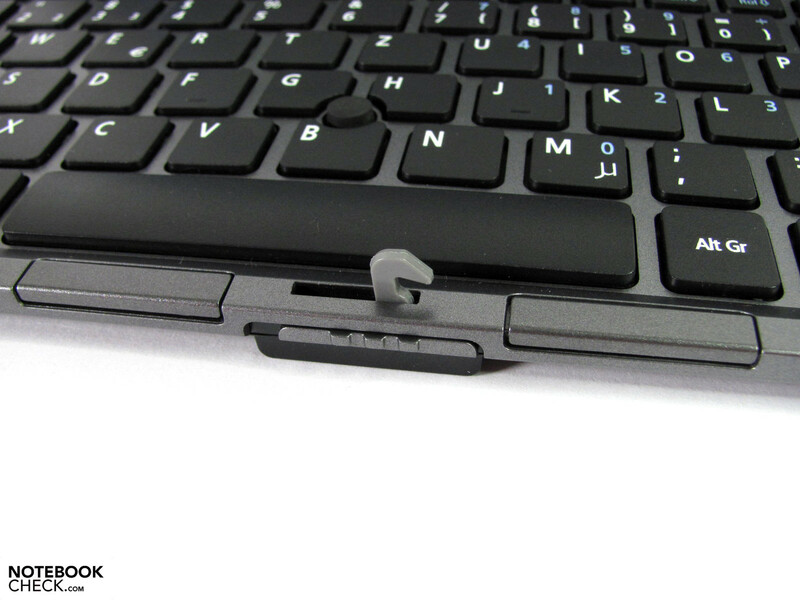 The PointStick keys' precision and handling isn't as good as in ThinkPad & co., but it has been well implemented. You can work astoundingly precise with finger control, despite comparatively large fingertips. Closing and opening windows, enlarging and zooming in on contents works well and smoothly. The Iconia W500 reaches the level of the Asus Eee Slate in this point. The onscreen display is very small due to Windows and need a lot of practice and patience. Here, mobile phone feel turns up and can consequently only be seen as a stopgap solution. 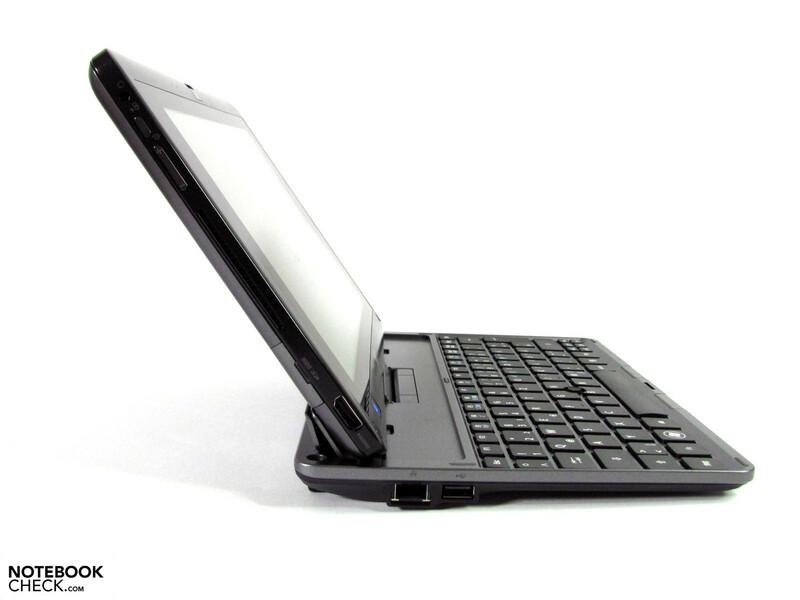 In our opinion, the W500 isn't suitable for extensive word processing tasks in tablet mode. Although Apple's solution isn't perfect, it is much better. 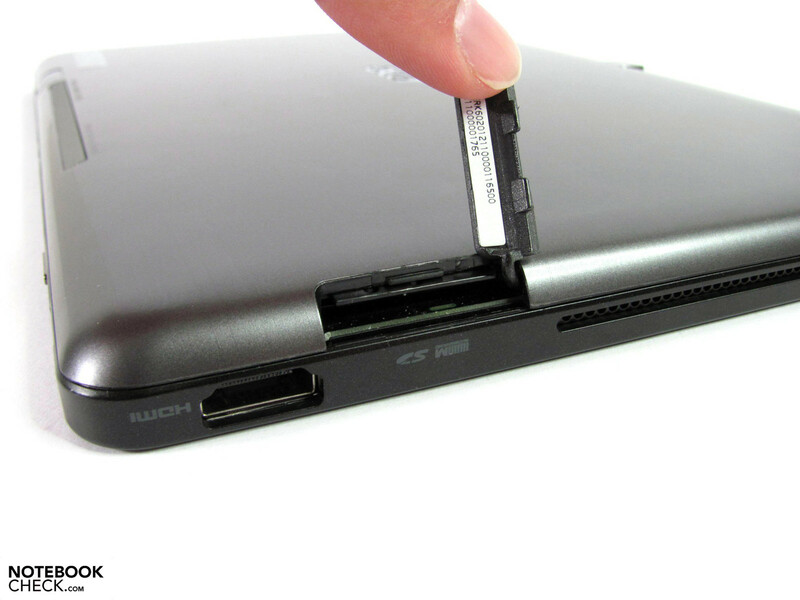 The Iconia can't compensate like the Asus Eee Slate with its stylus input option is able to. Unfortunately, it also lacks the associated function value that you would have had with an additional digitalizing function (sketching, drawing, handwritten inputs, etc). The greatest flaw still is that there is hardly any Windows 7 software available that is optimized for finger control. Here, you have to tediously look for according software on your own and also partly pay for it. 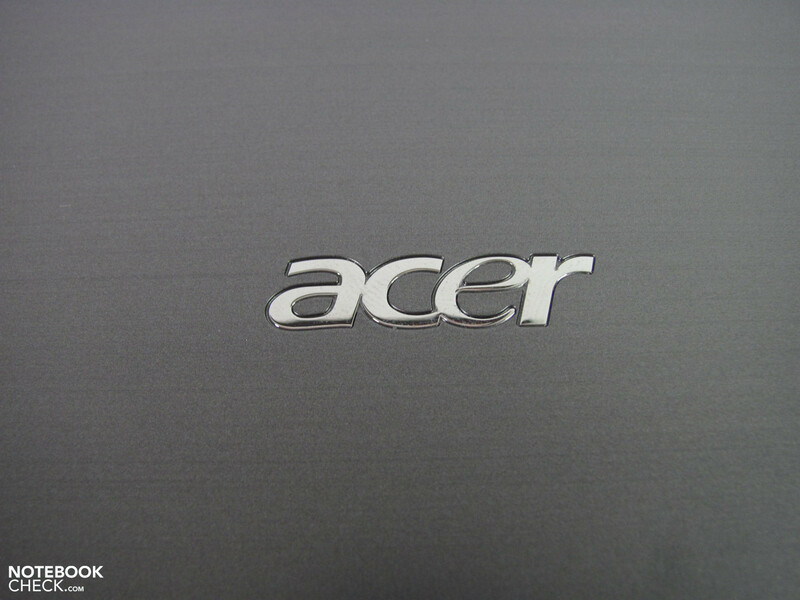 Acer's Ring is a nice start, but not particularly comprehensive with four programs and a few tools. Moreover, you can't modify it. Too bad that this alternative is still remote from a touch-optimized desktop the like of iOs or Android 3.0. The Iconia W500's reflective 10.1" multi-touch display has a resolution of 1280x800 pixels in a 16:10 format and thus has a lot more desktop surface than many tablet opponents. 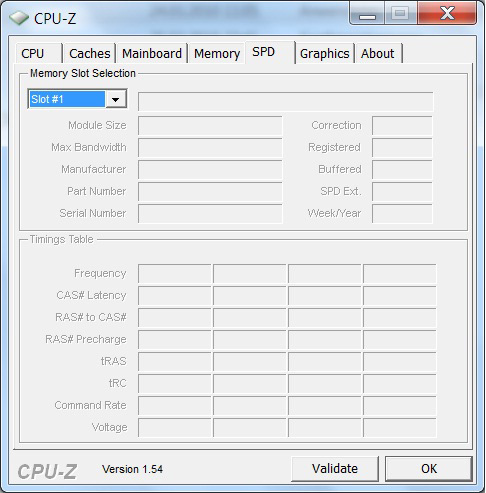 However, the display size should be modified to really hit the small icons and symbols of Windows 7. The screen has been given a visible display grid that lies over the desktop like a mesh. We last saw something similar in the Archos 101. Not very pretty, but you can live this peculiarity after a bit of getting used to. So, let's summarize the drawbacks: reflective and laced with a fine grid display surface. Now, only good news will follow. The screen's maximum brightness achieves very good 326 cd/m2 in the center and keeps this brightness upright even in battery mode. The illumination of the other 8 measuring points is 82% and the contrast ratio reaches a very good 881:1 owing to a black value of 0.37 cd/m2. The color appear saturated, black is really black, movies and pictures are shown from their best side. Outdoor use is very well possible due to the good rates. Nevertheless, intense reflections could have an adverse effect on the actual display content. Moreover, even the high luminosity of over 300 cd/m2 isn't enough for a use in direct sunlight. 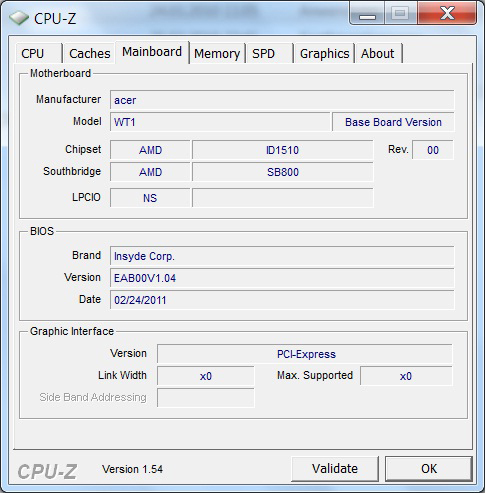 While the size and operating system quickly suggests a comparison with Asus' Eee Slate, the installed performance configuration proves to be very different. 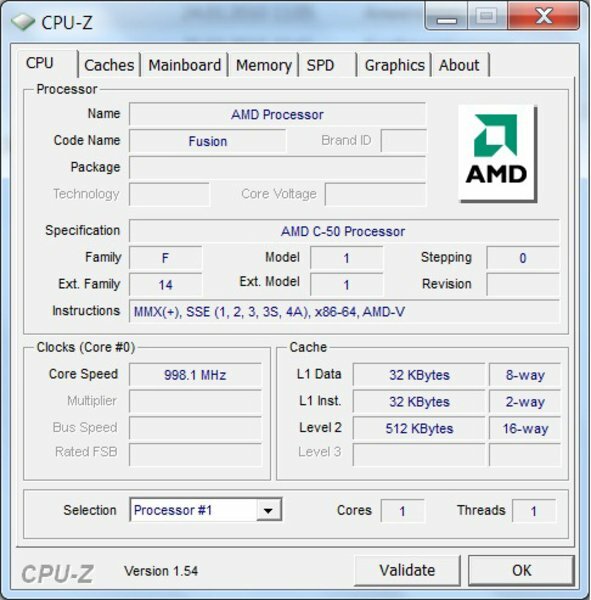 The Iconia W500's hardware sector relies on AMD technology, which is comprised of a C-50 CPU (2x1GHz) with integrated HD 6250 graphics unit (Fusion). However, the latest technology such as Turbo Boost and Hyper Threading won't be found. 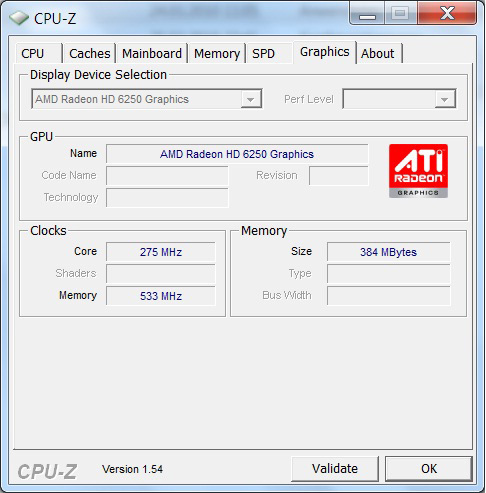 This configuration can be classified as on a similar level as the dual core Atom with Nvidia's Ion graphics in terms of performance. 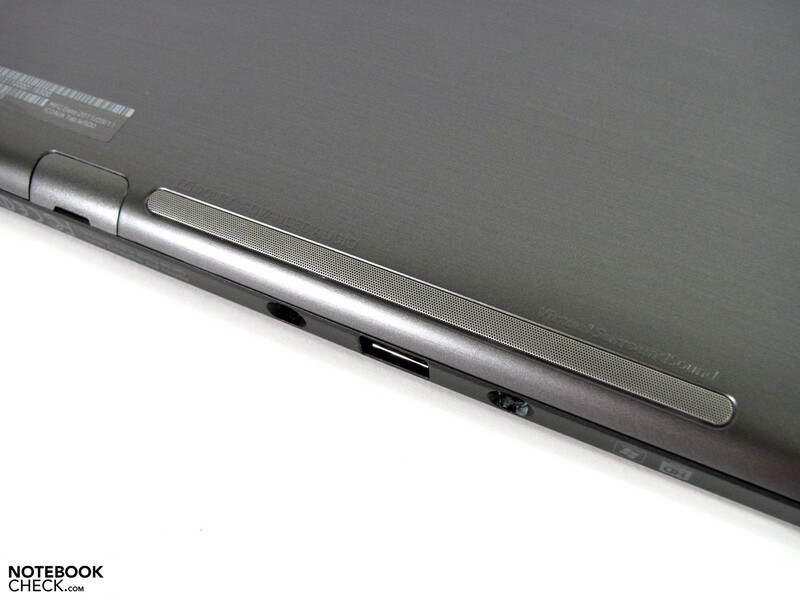 It also barely differs from netbooks that were previously equipped with AMD technology, such as the Toshiba NB550D. There is a 2 GB RAM available, which can't be upgraded. A Sandisk SSD module is used as the mass memory. 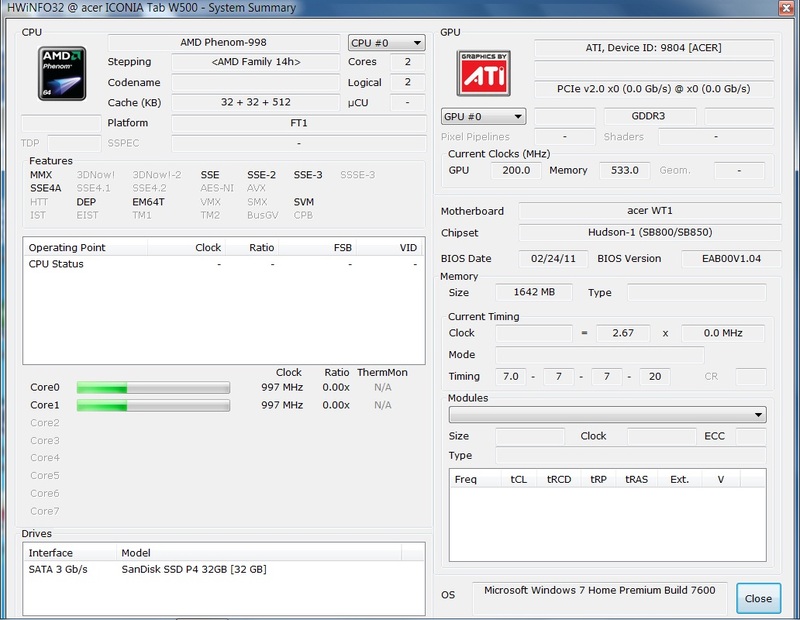 The CPU benchmarks are, as expected, comparable with the Intel Atom range based on two cores. Wprime 1024m needs an almost endless 3304s and the SuperPi calculation needs 3671s. Converting our iTunes test songs from a MP3 to an AAC format was executed in a 4.5-fold speed. 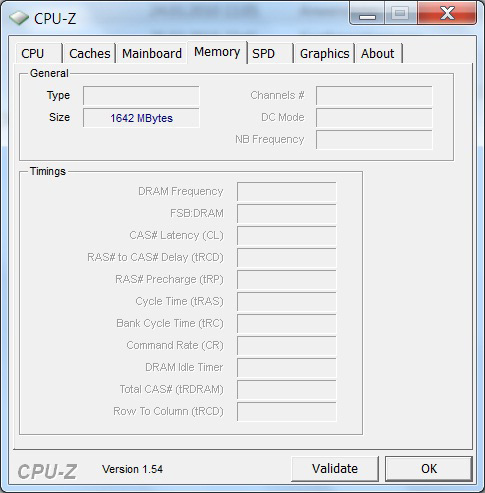 So, you won't want to have to manage CPU demanding tasks with it. The performance is sufficient for word processing, Internet, Skype & co. and these basic applications can be managed smoothly. 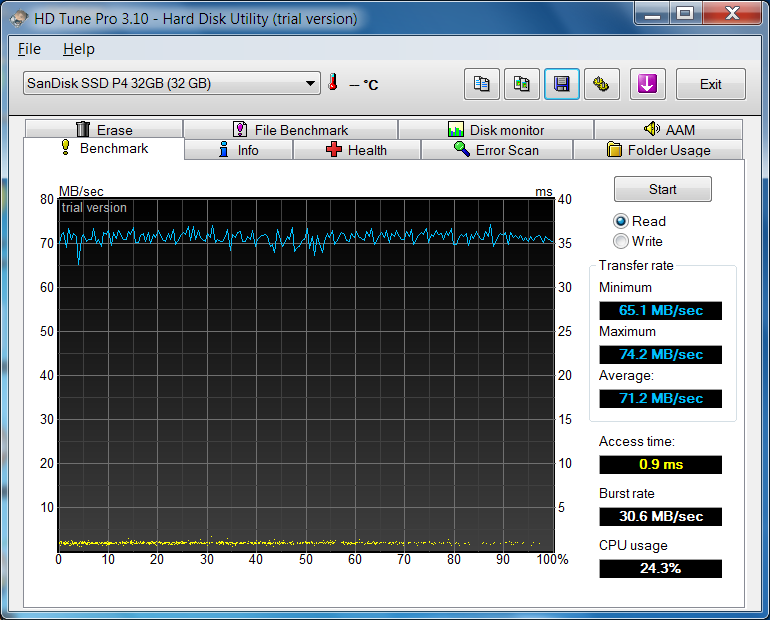 PCMark Vantage's 1831 points also show this, as they can benefit particularly from the fast SSD. Geekbench 2.1 presents a good possibility to compare the cross-platform performance. It determines the processor's and memory's performance. 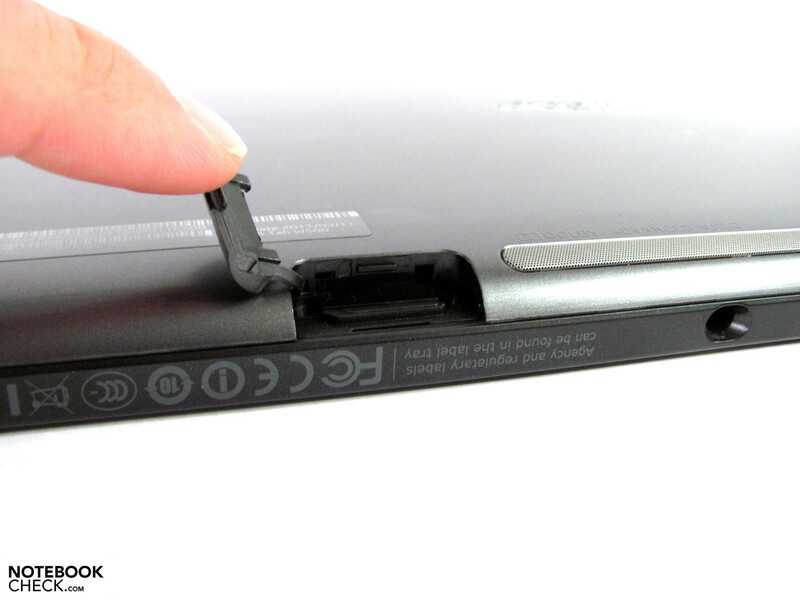 The Iconia Tab W500 achieves 947 points and thus places itself between the iPad 2 and the Asus 1005PE (Atom N450). The graphics performance clearly has more 3D potential than Intel's GMA 3150 solution, but we can't see a real advantage for practical use. It is no longer really enough for games and demanding 3D applications. Therefore, 1186 points in Cinebench R10's OpenGL shading and 425 points in 3DMark Vantage are nice for the statistics, but not much more. At least HD videos can be rendered smoothly in all resolutions up to 1080p. 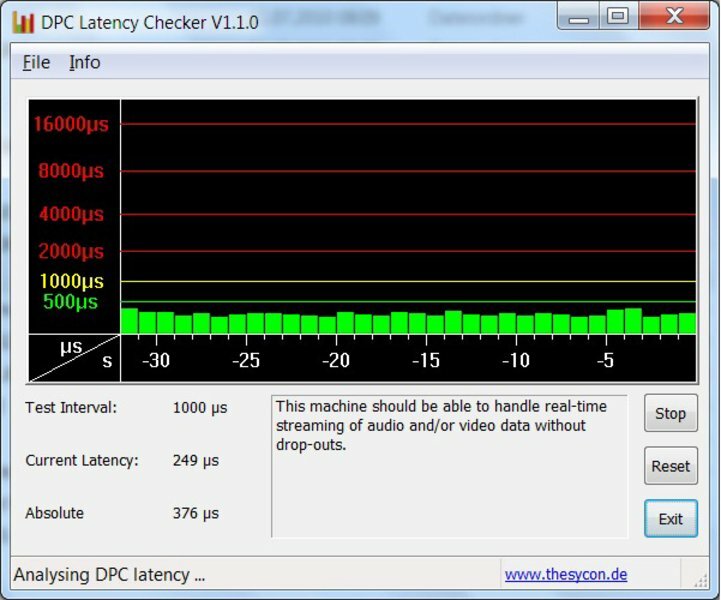 The test with the tool, DPC Latency Checker, shows a spike that shoots far beyond the critical limit of 2000µs. 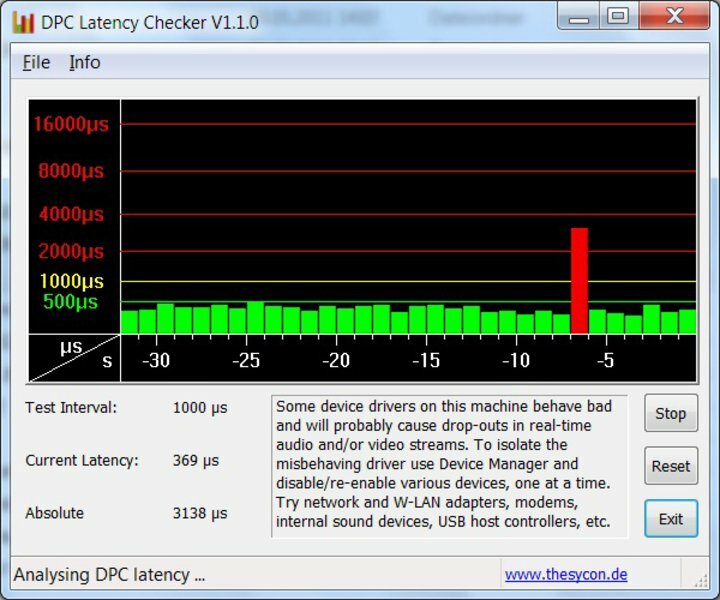 This could lead to synchronization errors, such as sound crackling or picture-sound deviations, when external peripherals are connected. The spikes stay in an uncritical green field as soon as the WLAN module is disabled. The use in the Keydock also doesn't have any adverse effects. 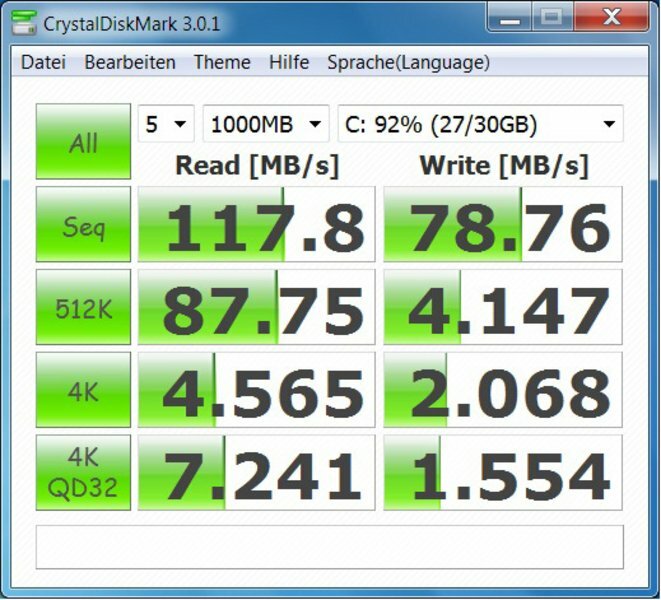 The installed P4 SSD from Sandisk bids a really good performance in comparison to conventional 1.8" hard disks. You have a fast disk at hand with transfer rates of 74 MB/s and sequential read rates of more than 100 MB/s. The short access rate of 0.4 ms is particularly noticeable during routine work, because programs are opened very fast. The capacity of 32GB is a bit tight for a Windows system. For example, we had to remove other files in order to have enough memory for the one or other gaming test. Thus, you will quickly reach the capacity's limit with a few pictures, movies and programs. You can solve this on the go with memory cards and on the Keydock with USB 2.0 hard disks. 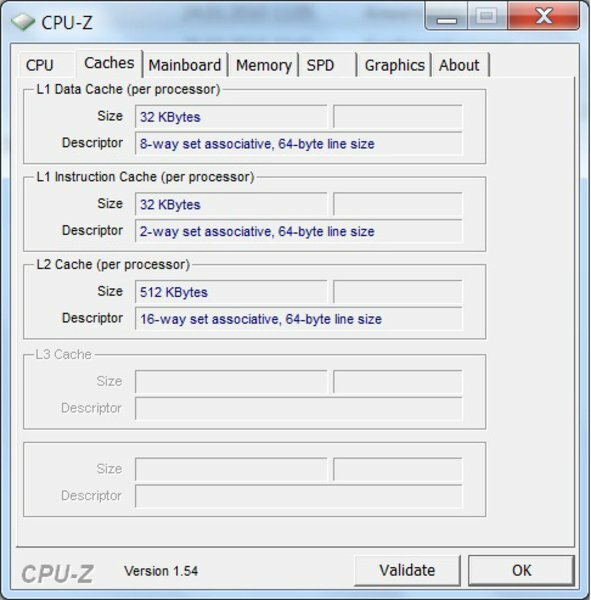 Tracks like Sims 3 or Anno 1404 are playable with low quality settings and reduced resolution. But then, they aren't really fun because it bids little optical gratification. The gaming performance is throughout feasible for a bit of occasional distraction. In the tablet sector, Apple's iPad is much more suitable for gaming. A lot of games are available that are perfectly attuned for the hardware and are really a lot of fun here. 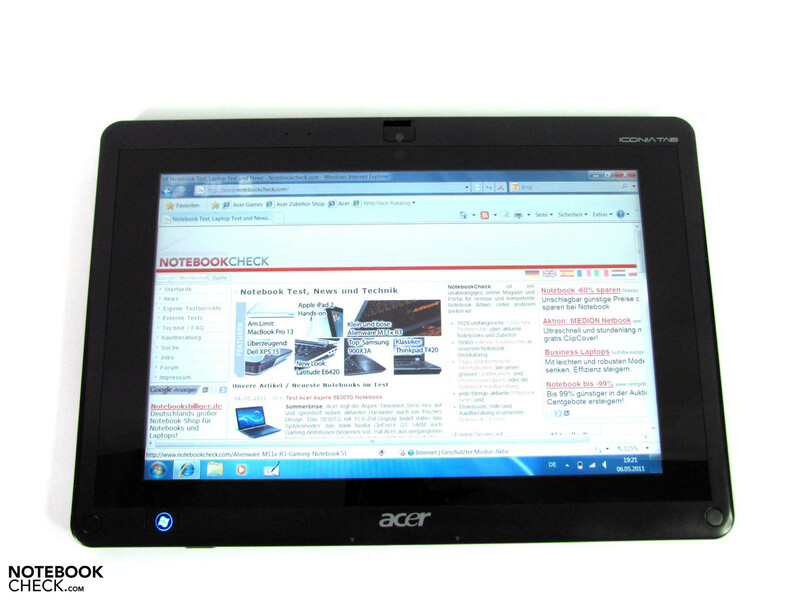 Acer's tablet stays very quiet in every situation with 29.3 dB(A) to 31.2 dB(A). Only an occasional quiet fan whir can be heard when you place your ear very close to the case or when the system is put under full load. We can't determine any restrictions even for noise sensitive persons. As in system noise, the Iconia Tab W500 also proves to be very restrained in the field of temperature emissions. You can hardly speak of a heated case with a maximum of 31.7°C during full load. The device stays all over cool during normal use. (+) The average temperature for the upper side under maximal load is 28 °C / 82 F, compared to the average of 30.7 °C / 87 F for the devices in the class Tablet. (+) The maximum temperature on the upper side is 31.6 °C / 89 F, compared to the average of 34.8 °C / 95 F, ranging from 22.2 to 51.8 °C for the class Tablet. The requirements for a long battery life are basically good due to economic AMD components. 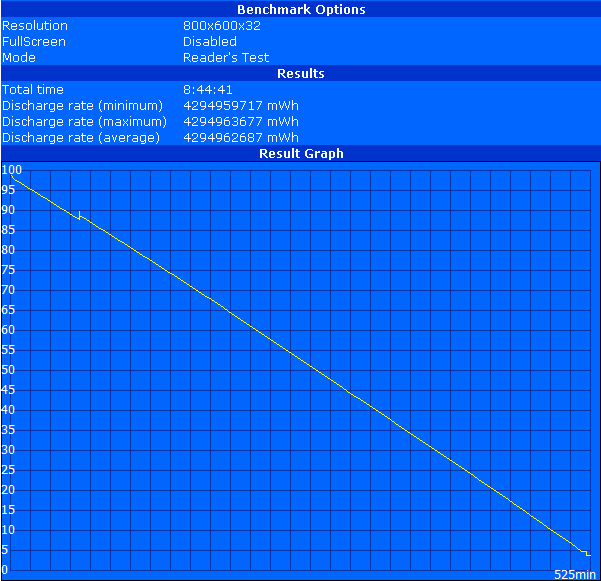 We measured a power consumption of 5.2 watts up to 9.4 watts at the mains. This rate doubles to a maximum of 18.4 watts during full load, when Furmark and Prime want to be satisfied. 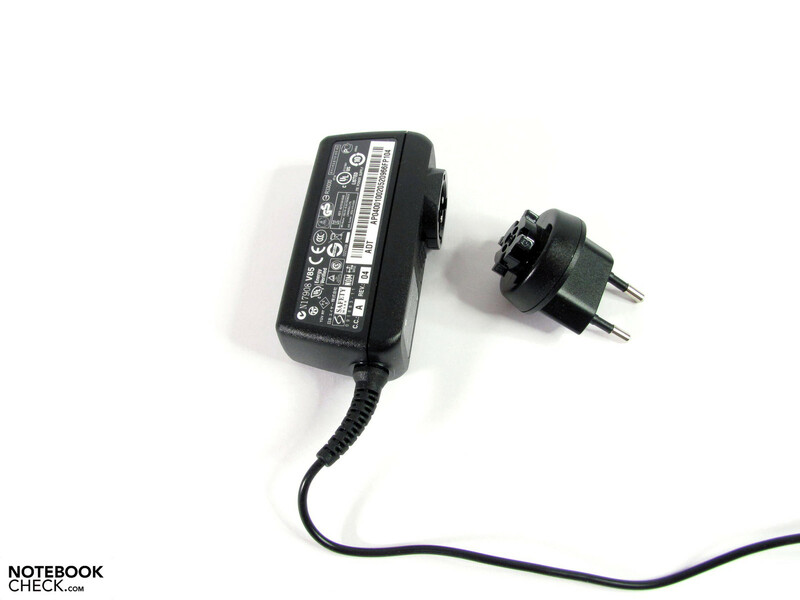 Apart from mains use, a built-in battery with a capacity of 35 watts supplies appealing runtimes. The psychologically important 8 hour mark is excelled with a runtime of 525 min in BatteryEater's Reader's Test (maximum possible battery life with minimum display brightness, wireless networks off, energy savings mode). These setting aren't really viable in practical use just because of the low display brightness. A significantly more representative value is the life with WLAN surfing in maximum brightness and enabled wireless module, also in energy saving mode). We clearly achieved more than 6 hours of work time with a battery life of 381 min. The battery lasts for over 5 hours when watching a video rendered from the solid state drive (balanced profile). Thus, it still has enough capacity left over for other tasks after a 2 hour movie. Train journey – here we come. 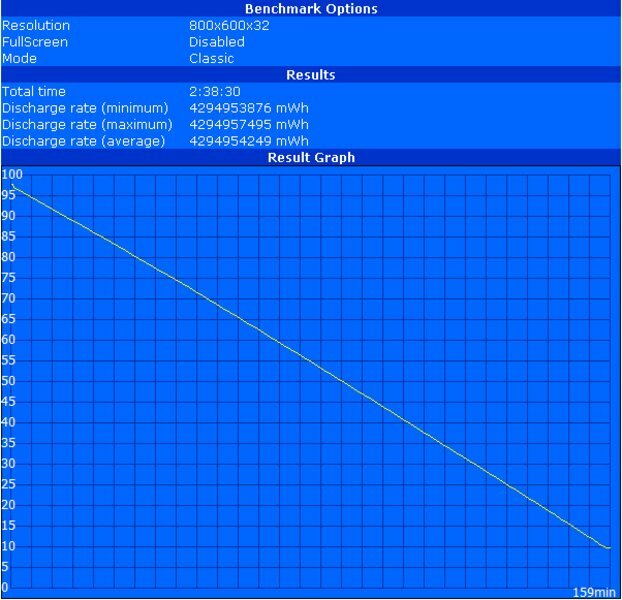 The system is absolutely and completely demanded in the BatteryEater Classic Test (maximum brightness, graphics chip set to maximum performance in battery mode). Nevertheless, the result of over 2.5 hours of runtime (159 minutes) is astoundingly good in this point (12 minute longer runtime with downclocked graphics chip via ATI Powerplay in battery mode). Asus' Eee Slate only achieves 1.5 hours, but also supplies considerably more computing power. Overall, the Iconia's battery life is still good with a practical 3 to 6 hours and opens many mobile application possibilities. 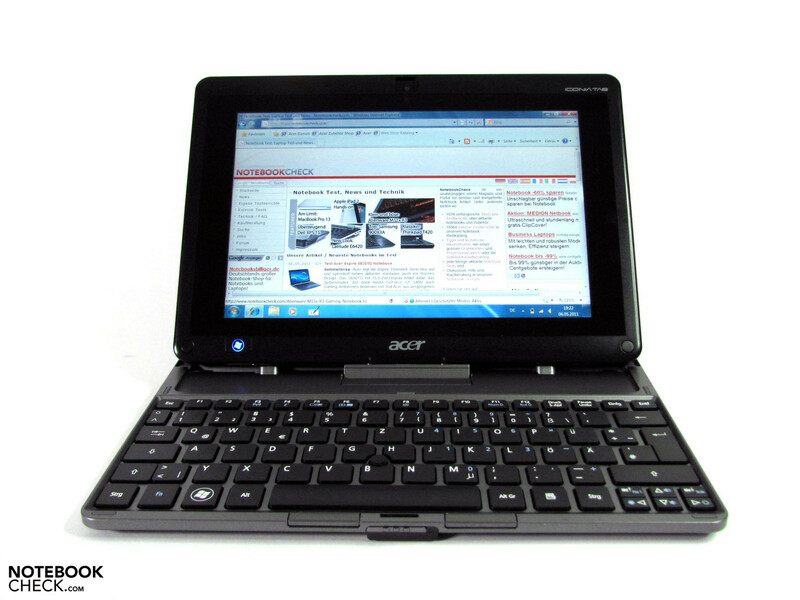 The Acer Iconia Tab W500 tries to fuse the advantages of a tablet with those of a conventional netbook. This has only been achieved to a part. While the performance data, the docking concept and the battery life is basically impressive, the high weight is noticed particularly unfavorably. Almost a kilogram for the tablet and over 1.5 kg for everything is simply too much. In return, the case quality is solid, the external keyboard is practical and the control buttons at the edge are easy to use. We also like the very bright and contrast rich display, although it has a reflective surface. 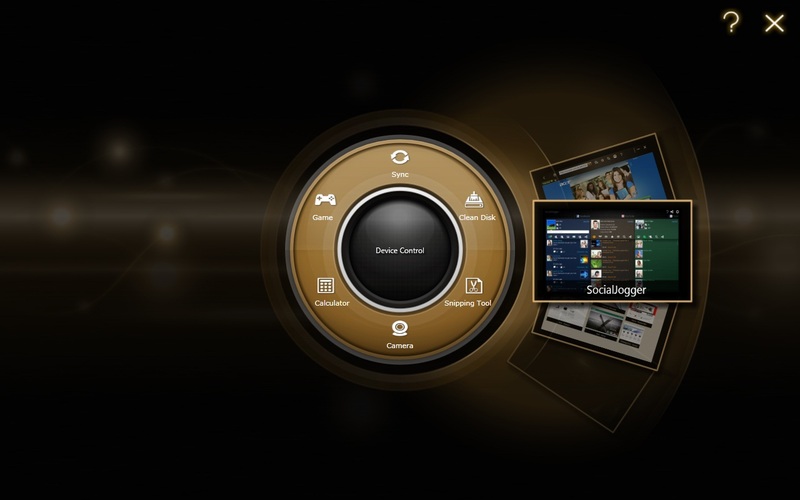 It convinces with a good sensitivity and precision in basic multi-touch gestures. The low emissions that only get perceptible in high load scenarios if at all are just as exemplary. The display's good traits are often degraded by the hardly modified Windows operating system. A stylus, like in the Asus Eee Slate, could have compensated many drawbacks. But nothing of the like is intended. However, Windows 7 also has its advantages. Existing software, peripherals and other accessories can be used easily. You don't need any special apps, overpriced additional hardware and don't have to arrange an accommodation period for a different operating system. Ultimately, almost 600 euros is a fair price when you are aware of the drawbacks and advantages of the Acer Iconia Tab W500, and if you don't fear investing a bit of work in the configuration and software extension. 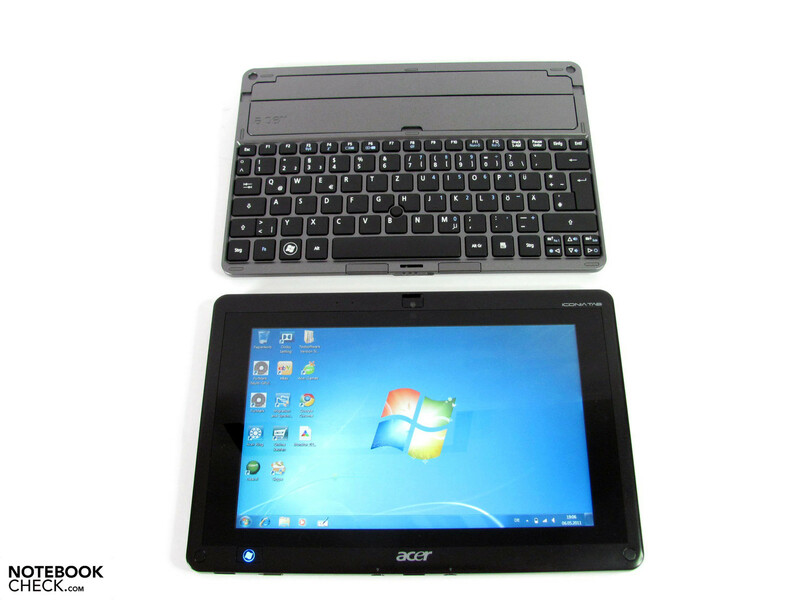 Acer's Iconia Tab W500 wants to unite tablet and netbook. the SIM slot in our test model wasn't functional. 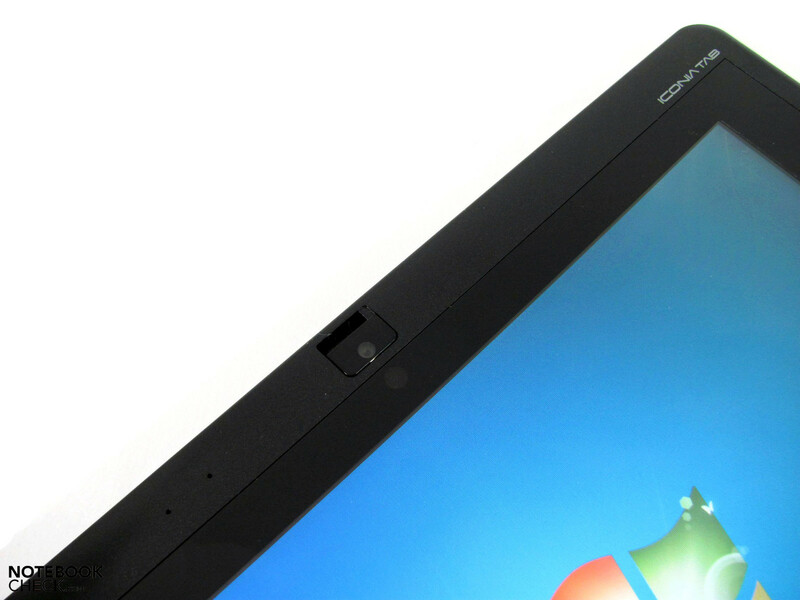 The direction lock is on the edge, as usual for tablets. The HDMI connection is full size. 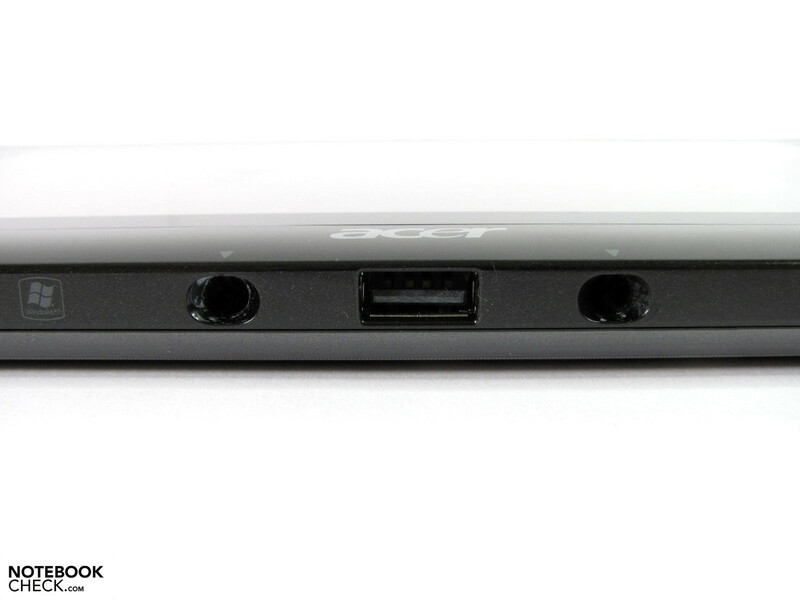 The USB port for the Keydock can also be used in the usual way. 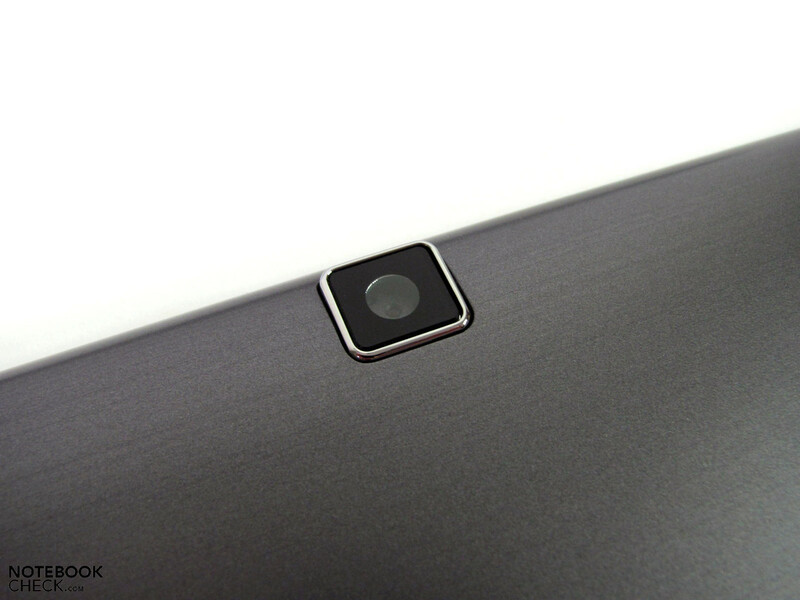 A 1.3 MP webcam on both front and rear. The narrow speaker bar doesn't supply quality sound. The Windows button for waking up from sleep state. The display bids a high resolution of 1280x800 pixels. The broad display bezel seems to also have room for 12” screens. 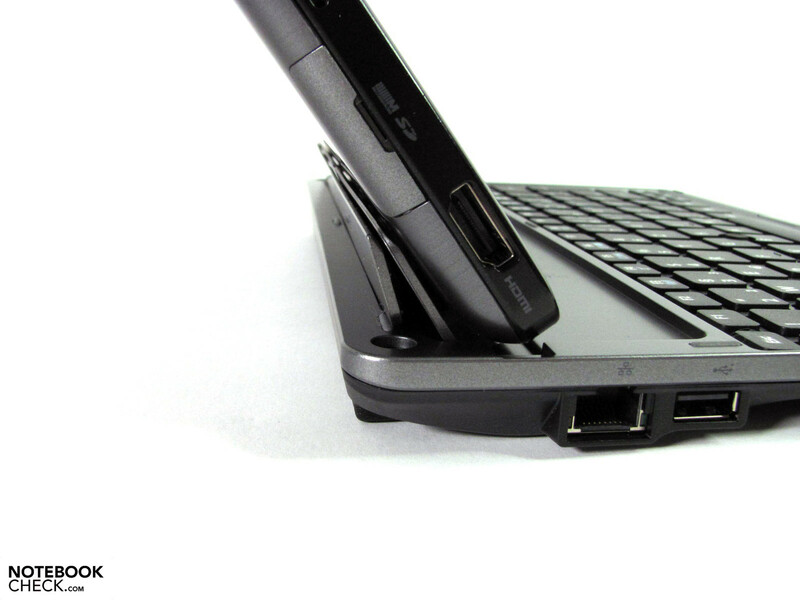 The tablet PC is attached to the Keydock with a latch, as well as a magnet. Those on the device can't be used with the dock, respectively when occupied. There is a USB port on every side. 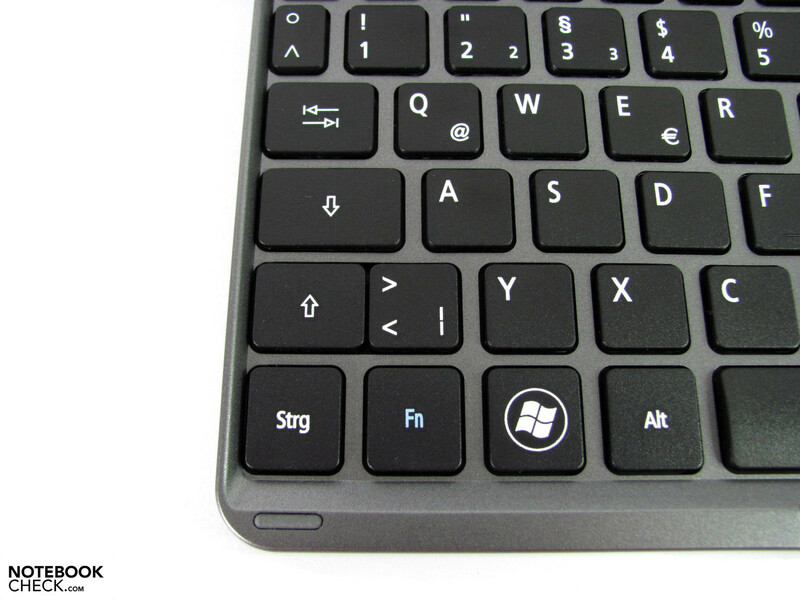 Portable as a tablet and stationary with dockable keyboard. and is thus considerably heavier than iPad & co.
Pure-bred tablets or netbooks are superior in single fields. Even the iPad 1 is a lot thinner and lighter. The Iconia Tab reaches the size, but not the weight of a HP Mini 5101.
and more interfaces, including Ethernet. The stability suffers under the top heaviness of the combination depending on the surface. The small, light power adapter doesn't need much room in the bag. The docking concept with its extended possibilities. Windows 7 with its usual large functionality and the well suitable display. A modified surface that would be better for finger control. A stylus option and the resulting alternative use option. A matt display surface and faster interfaces. That Acer's Iconia Tab has been placed very attractively in terms of price and even has been treated to a very good display. Apple iPad 2, Samsung Galaxy Tab, Asus Eee Slate, Motorola Xoom, Acer Iconia A500.